Guests visiting a resort or vacation beach house in beautiful Southwest Florida may give little thought to what it takes to have fresh linen in place upon arrival and rotated during their stay. The luxurious feel of fluffy beach towels after a swim in the pool are often the subtle touches guests remember. So the linen company selected to handle the vital task of providing quality guest linen is an important decision. Quality Guest Linen serves all the main cities and several islands that call Southwest Florida home. This beautiful island, best known for a vast array of seashells, is a top tourist destination in Southwest Florida. The daily mix of beach, sun and sand helps vacationers generate large amounts of laundry. Keeping up with the loads of linen is a massive undertaking for local vacation properties. We are the linen company to handle it all. 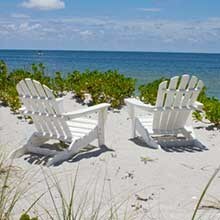 Captiva Island is best known for its laid back atmosphere, complimented by the warm waves of the Gulf of Mexico. Like the rest of Southwest Florida, visitors are beckoned to relax and play in this breathtaking tropical island paradise. Lounging or beach towels or a midday nap on cool sheets, let us be the linen company of choice. Fort Myers, in the heart of Southwest Florida, welcomes visitors from around the world. Snowbirds arrive to thaw out here in the Sunshine State for a few months. Fort Myers is home to the spring training camps of the Boston Red Sox and the Minnesota Twins. It’s Fort Myers’ high season. The increase of guests translates to high occupancy rates for area accommodations. And those guests generate several loads of laundry daily. Win the game and hit a linen company home run with Quality Guest Linen Services. The growing city of Bonita Springs is nestled between Fort Myers and Naples on the coast of Southwest Florida. The city’s prefect proximity allows great access to the Gulf of Mexico and area attractions. A thriving hospitality sector fueled by tourism and the demanding healthcare industry are just examples of the need for a commercial linen company to handle the load. The elegant culture of Naples attracts many to this world-class city. Enjoy spectacular sunsets while walking along the area’s pristine white sandy beaches. Behind the scenes, the region’s top-rated restaurants play close attention to details like the linen used at each table. Beach house rentals in Naples along with the top resorts and country clubs go to great lengths to provide the best towels and other products. Our locally-based linen company is the best choice in Southwest Florida. Another of the gorgeous barrier islands of Southwest Florida, Marco Island is located south of Naples and is the largest of the Ten Thousand Islands. Boaters flock here to join the locals in enjoying the great tropical weather. So with all the fun outdoor activities, there is sure to be an increasing need for a local linen company to assist in managing the laundry generated by local vacation rentals, resorts and hotels. Cape Coral, across the Caloosahatchee River north of Fort Myers, is a waterfront paradise. The city’s network of canals makes enjoying the water easy for all. Eliminate the task of cleaning guest laundry and trust our locally-based linen company to get the job done. In the area’s newest city of Estero you’ll find venues for sports and entertainment a short drive from the beaches along the Gulf of Mexico. Vacation rentals, restaurants, and restaurants all must keep up with the number of people in the region ready to play. As a linen company we can partner with commercial clients to manage all the laundry. All our clients will have to worry about is finding space to suit the masses.